Spot me and my lens, gotta love reflective packaging! Confession time: I don't 'get' the hype surrounding most BB and CC creams. The ones I have tried are usually very thick and either leave my skin with a white cast or looking super orange. When I heard about this new Estée Lauder* offering though I was intrigued. The new BB Moisture Makeup promises all the benefits of a traditional BB cream along with a lightweight finish that brightens and perfects the skin. The BB cream itself is both fragrance and oil-free, so it is suitable for all skin types. It has a lightweight formula that is easy to blend and doesn't look cakey on the skin. It almost has a colour correcting effect as it adjusts to your natural skintone. There is some dewiness to it but it's not excessive. You can either wear this underneath foundation or on its own, the latter which I prefer. The coverage it has is more light-medium. You won't get as much coverage as you would from a foundation but you could still get away with wearing this on its own. As I have combination skin, I tend to set this with a little bit of powder but if shine isn't a problem then you could probably skip that step. So my first (proper) foray into BB cream territory has been a success. I love the lightweight feel to this product and it's all I've been reaching for lately on minimal makeup days. BB Glow has just the right amount of glow to it and for a BB cream it boasts pretty impressive lasting power. The new base will be available on counters from the 16th of June along with a BB highlighter pen. -Have you tried any BB creams before? Which are your favourites? Ah this is very helpful! 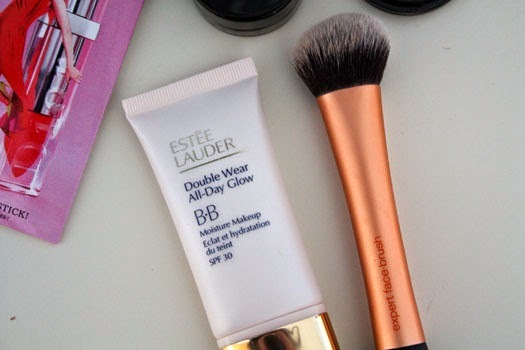 I wore EL Double Wear for a very long time, and I also have a love/hate relationship with BB creams, so this might just be the middle ground I'm looking for!